When you’re talking about solar systems in the Philippines, the first name that comes to mind is Solaric. It’s 2018, and Solaric rules the rooftops. How do you juggle a family, hobbies, friends, travel, and a fast-growing solar tech company? Solaric Founders Mike and Jade De Guzman open themselves up to personal questions — and life probes. What is a day like for these two solar tech geniuses, in the midst of the rise of this national corporate entity? Their daily bustle on the surface is hectic, busy, non-stop. As soon as the sun’s rays peek out the morning sky, these two are up and about. Mike is in his kitchen brewing his daily pre-sunshine quad shot of ultra-caffeinated coffee, and Jade is off to the tennis court for her non-negotiable daily dose of endorphins. Mike then heads off to either the shooting range or biking, depending on his mood and schedule. On tight days, he would have to jam 24 kilometers in under an hour. It is six o’clock on a bright Friday morning and the De Guzmans are nowhere near where most chief executives of the corporate universe would be at rush hour of horror day traffic. Mike is sitting on his solar-powered golf cart on a conference call with executives from all over the world regarding a solar plant for yet another Southeast Asian country, and Jade is playing tennis while giving ten orders per minute to her staff on her phone, in between sets where she hardly even misses a shot. Unknown to this SEA Games medalist in shooting, she drives the tennis trainers and ball boys to the brink of exhaustion as she aims to perfect her serve, volley, and return. Observing Jade throughout the day, I realized that this is exactly the same way she devotes herself to work. It is all about calculated moves and mastery of the game. The minutes, however, are precious, as they both have to be back home in time to see their son off to school. Yes, it’s all clockwork and time management, and this is just another ordinary morning. Mike and Jade are co-founders of Solaric, which is unlike any other company in the ever-growing solar industry of the nation. They give the giant utility companies in the energy sector something they have never seen before: competition. Not too long ago, there was no escaping an electric bill. People would cry, would complain, but begrudgingly line up to pay their bills. What is their day job exactly? They deploy solar technology that slashes electric bills. They slice it, dice it, until it’s zero. In more acceptable corporate lingo, they deliver cost effective power through clean, safe, and renewable solar options that are economically sensible and environmentally sound. They provide sustainable energy systems nationwide, available to every homeowner, business, school, non-profit organization, government and non-government organization in the country. 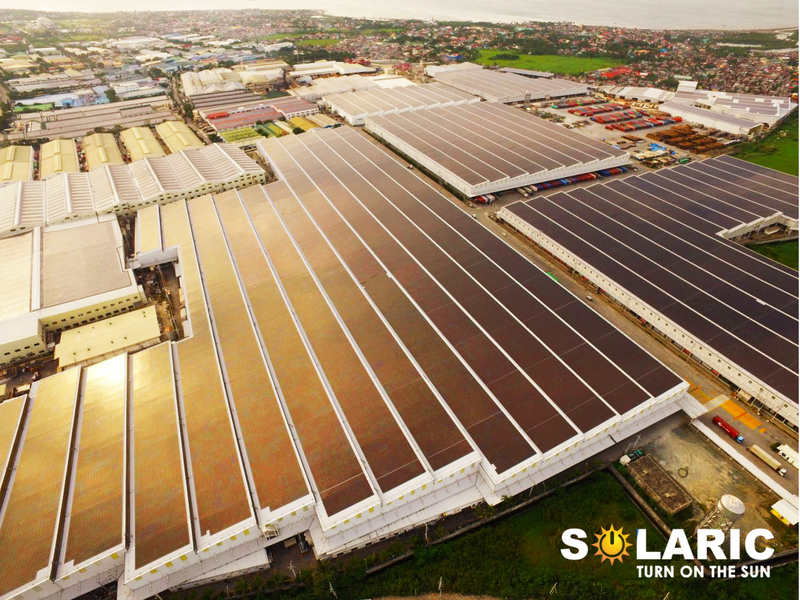 Solaric has installed thousands of panels in thousands of homes, factories, buildings, warehouses, military sites, and commercial and industrial sites all over the Philippines, which has taken them to the top of the list in large scale commercial and residential installations, as well as solar equipment sales. No other solar entity can keep up with their pace, and their installation rate accelerates each year, leaving rivals scratching their heads and wondering why they can’t seem to keep up. Although most executives will walk into an interview clad in the most elegant of business suits, this married couple comes in their true tech-CEO wear: untucked t-shirt, jeans, and sneakers. “Yes, we wear the same thing even to signing of contracts worth hundreds of millions,” Jade replies. “I only wear a barong if it’s required, like in a Senate energy hearing. But in most cases, I prefer wear that is comfortable and would allow me to go on a roof…as long as it doesn’t have holes!” Mike laughs his signature laugh. When schedule permits, Mike randomly drops by a few of their ongoing job sites to conduct routine inspections and to occasionally treat the crew out for the famed “crispy pata for appetizer”. The heart of Solaric is really about people coming together to break and share bread. This is an underlying theme we see. Every Friday, the employees have an Iron Chef competition. This is complete with international cuisine dishes, wild food battles, and token prizes. How did this all start? “Well, it all started with Yolanda,” says Jade. She went on to recall the events of November 2013, when one of the strongest tropical cyclones ever recorded in world history rocked the Philippines. Typhoon Haiyan (also known as Typhoon Yolanda) was referred to as the country’s deadliest typhoon, being the strongest storm recorded at landfall and the strongest typhoon ever recorded in terms of one-minute sustained wind speed. Yolanda devastated most of Surigao, Eastern Samar and Tacloban City, bringing their inhabitants to their knees. And that is how it all began. In a place that was struck by disaster and plagued by darkness, Solaric turned on the sun. They delivered power in the worst possible operating conditions when others would not – and when other could not. That was how Solaric’s volunteer effort gave birth to a ripple effect that would eventually come to be known as the solar trend of the nation. It is this same passion that defines the De Guzmans’ fast-growing company. Solaric is composed of the most experienced clean energy project management and installation teams in the country. Solaric engineers serve clients all over the Philippines, ASEAN countries, and even United States and Africa. Their people are creative and engaged – everyone goes the extra mile (or extra watt). A closer look took me to the core of their company culture, which is really about the constant pursuit for excellence. “One of the most important lessons that we’ve learned in the last five years is about setting the bar. What we really did was show you how to raise that bar, because mediocre is never acceptable. So now you have that extraordinary Solaric DNA inside of you. That is how we’ve reached such spectacular levels of success. And that is how we keep thinking about bigger, better, brighter. So take that insane momentum, and continue to fuel it, until your contagious passion for excellence has infected each and every single person you interact with. There will be mistakes and challenges. But we have to learn from these and rise up, because that is exactly how we will keep our legendary status,” wrote Mike and Jade, in their mid-year email to the employees. Solaric first started net metering in their home in 2013. It was the first house to sell solar power back to the grid, with Peak Off Peak (POP) Net Meter Serial Number #00001. Solaric clients fell in love with the fact that batteries were no longer needed, because surplus energy can now be traded for “credits”. “This was a nationwide win that was actually one of the rewards of the renewable energy law,” Mike explains, while flipping through the Solaric book and showing me photos. “When Solaric was born half a decade ago, people didn’t really know much about solar energy or understand the technical stuff behind solar panels. Filipinos needed to learn about their options. So Solaric stepped in and trained them on solar power and solar panel systems through monthly SOLAR101 and SOLAR202 seminar courses that we ourselves teach. We’ve officially trained over 5,000 people on solar,” emphasizes Jade, as she shows me the framed collage of class photos. Additionally, Mike and Jade are constantly called on as key resource persons whenever clean and renewable energy is the topic of discussion – be it a corporate, government, school, or non-profit organization setting. Another example is their out-of-the-box social media page, which Mike takes pride in handling himself. “He writes all the creative content and manages most of the posts,” Jade says, “It’s part of his obsession for originality,” she says, as she takes a gulp of her dragonfruit-banana-kale fruit shake. In essence, that is exactly how Solaric is transforming the nation – through ideas and creativity that others haven’t even yet considered. Last I heard, it was the solar-powered golf cart. This week, it’s the solar souped up scooter. Next month, it will be another gamechanger. It’s almost 2019 and Filipinos are being ushered into the era of solar energy and sustainable living. “Solaric still has a lot of work to do. If the Philippines does its part to reverse climate change, our country needs to install at least 300 MegaWatts a year of solar rooftop,” says Mike. Yes, the vision is promising in as much as it is inspiring. The solar revolution is just getting started. It is, in fact, irrevocably true: Solaric is the nation’s solar king.